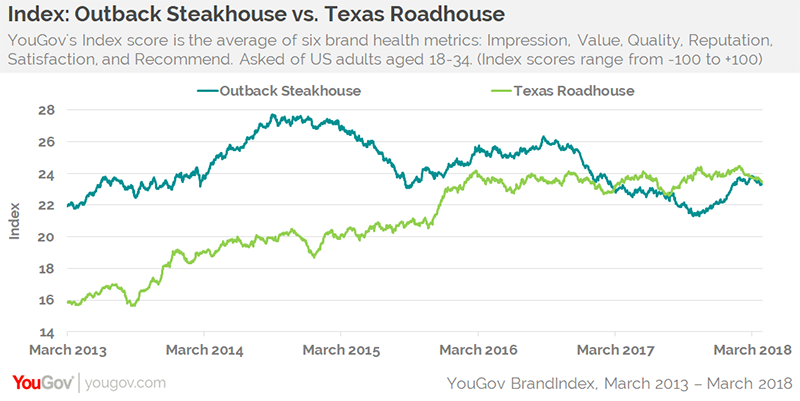 Texas Roadhouse and Outback Steakhouse battled for supremacy on Twitter recently, but in the real world, the numbers don’t lie: Texas Roadhouse surpassed Outback Steakhouse in current millennial customers while catching up in overall brand health, according to YouGov BrandIndex. For the past five years, Texas Roadhouse has been in a solid upward trajectory with millennials: since 2013, the percentage of adults 18 to 34 who have said they patronized Texas Roadhouse in the past 30 days has doubled from 4% to 8%. Texas Roadhouse passed Outback Steakhouse in September 2016, and has stayed ahead of them since then. Compared to the rest of the casual dining sector, which averages a 3% current customer level, millennials have been more frequent current customers at the two steak chains. 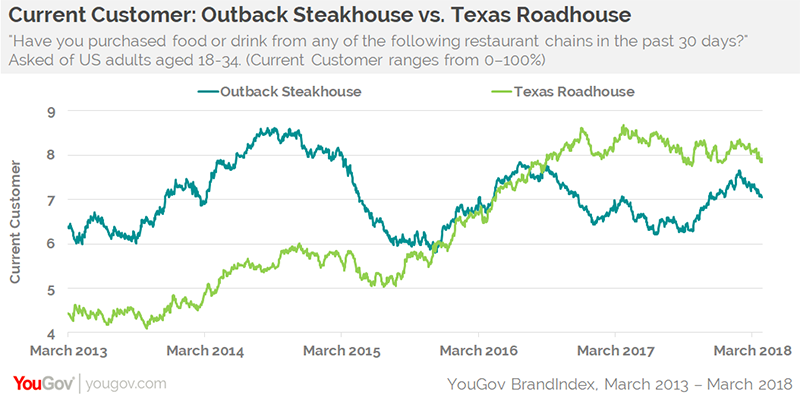 While Texas Roadhouse’s brand health metrics caught up with Outback Steakhouse in March 2017, it’s been difficult for either chain to maintain a lead; they’ve been neck and neck since February.